Happy Hump day lovelies! So yesterday, I had a special request from my friend who asked me if I could make a paleo vegan dish for her potluck dinner party. Everyone who was coming to the party was either vegan or paleo. That's one healthy group for ya! After brainstorming bunch of recipes in my head, I decided to make this Roasted Eggplant with spiced chickpeas, cherry tomatoes and drizzled with tahini sauce. This was a crowd pleaser! You can have this as an appetizer or the main course! High in protein and very low carb. This recipe was featured in our Weekly Meal Plan Newsletter - Looking for dinner ideas? Sign up here! Preheat oven to 425˚F. Cut eggplants in half lengthwise. Puncture each eggplant with a fork and place on a parchment lined baking tray. Drizzle with olive oil and put in oven for 20 min. Meanwhile in a saucepan, sauté shallots and garlic over medium heat for 5-8 min with 3 tablespoon of olive oil. Add grape tomatoes and spices and continue sautéing for 10 min, or until tomatoes are plump. Take the eggplants out of the oven once they are cooked. Carefully remove the flesh of the eggplant and add just the flesh to the sautéed tomatoes and leave the skin part of the eggplant aside. You will be stuffing them later. Continue sautéing tomatoes with Eggplant flesh for about 5 min then add chickpeas. Cook for another 5 min. If the the mix is too dry add couple of tablespoons of water. Add salt and pepper to taste. 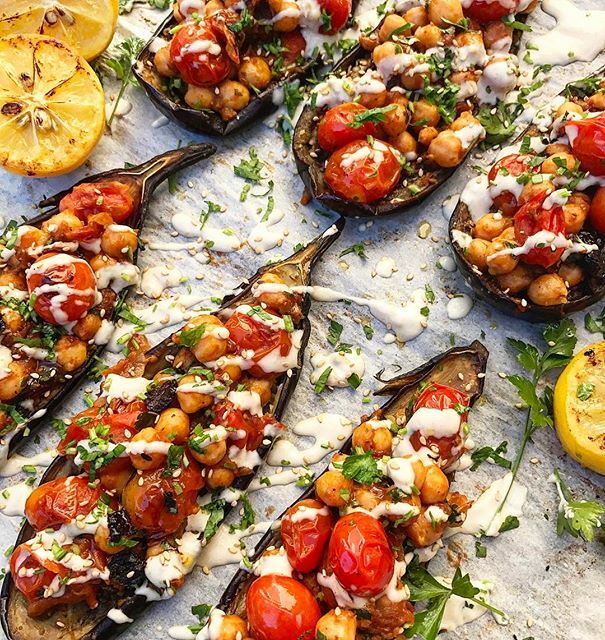 Stuff eggplant boats with the chickpea mix, sprinkle with some chopped parsley and drizzle with tahini sauce. For tahini sauce mix 2 tbps of tahini with juice of half a lemon, add salt and pepper and some garlic powder to it. Mix well. Serve it with some quinoa or fresh arugula salad.